I typically do not comment on or review large chain operations. Their practices are what they are for a reason: profitability. They genuinely do not care for the customer experience beyond insuring their brand is not tarnished by rogue comments from some social media diva such as yours truly. So why bother? Well today I bother. I simply feel like ranting. Two major complaints. First up, your practice of flip that table is excessive. We felt rushed the entire meal, especially being handed our check while still eating our entrees and told “it can be changed if you want dessert”. Second, your food has really gone downhill. Everything I ate needed salt. EVERYTHING. Beans undercooked. You charge premium pricing for Tex-Mex food. You should serve premium food. It was bland across the boards and lackluster at best. This was my second visit in 30 days and consistent results both visits. Pappas Restaurants welcomes feedback from our Guests. We make efforts to utilize the information toward improving future dining experiences. We regret that you found circumstances of your recent visit disappointing. Your comments will be shared with the restaurant General Manager and we will follow up with you formally via the mailing address you provided. …Please do not reply to this email. Yeah, I won’t. Why? Because nobody will get it except the corporate email server that’ll dump it into the bit bucket. …and here I sit waiting for that response from the General Manager six days later and counting…. For the record on this particular visit I had the Chicken Fajitas ($20.95; ouch) with fresh flour tortillas, refried beans, pico de gallo and guacamole. I wanted sour cream and cheese so I had to pay extra for “The Works” ($4.95) to get a small dollop of sour cream, a little bit of shredded cheddar cheese and a huge pile of inexpensive lettuce and peppers which I didn’t want. As already indicated in my comments above everything I had was bland, requiring a liberal dose from the salt shaker on the table and the refried beans were flat out undercooked, firm and almost chewy. This dish is not recommended. $25.90 to be rushed to eat bland food. I must be insane. All the usual speel to wrap things up. Casual attire, free parking in the lot in front, major credit cards accepted, yada yada yada. Conclusion: shame on you Pappasito’s. You’ve lost your way. I won’t knowingly go back without some arm twisting. Istanbul Grill is a family owned and operated Turkish grill located in a strip center in Southern Arlington. The emphasis here is on grilled meats with Mediterranean appetizers and side dishes. We started our meal with the Hummus ($5.95) made with mashed chickpeas, garlic and tahini paste. The Hummus at Istanbul Grill is some of the best hummus I’ve had at a Middle Eastern/Greek influenced restaurant anywhere in the area. This appetizer is recommended. We also shared a hot appetizer of Cigarette Borek ($5.95) consisting of cigarette sized slices of creamy feta cheese wrapped in phyllo dough and fried before serving. It was interesting with mild, savory flavors but not something I need to order every time I come unlike the hummus. My entree for the evening was the Lamb ADANA ($11.95) consisting of spicy ground lamb rolled lengthwise like a cigar before grilling. The meat was very flavorful and moist, perfectly grilled. The dish is accompanied by delicious and moist rice with a pungent, vinegar laden slaw to cleanse the palate between savory, fatty bites of meat. This dish is recommended. Service is very attentive. Kitchen service is quick, even on a busy Friday evening. The real sparkle on this gem is Istanbul Grill is pure BYOB. Feel free to bring your own bottle of wine or beer to pair with your meal. There is no corkage fee. Glasses are barely passable so if you’re picky about your stemware feel free to bring your own. We did. NOTE: Wine BYOB is very popular here. During our recent Friday visit every party that came through the door brought a bottle of wine with the exception of two. Parking is free in the strip center lot in front of the restaurant. There is no valet parking. Attire is casual; jeans and a casual shirt more than get the job done and seem to be the outfit of choice during our visits there. Reservations are accepted but for the most part the restaurant seems to be a walk in place. Maybe call ahead on busy evenings. Major credit cards accepted. Conclusion: I’ve been here multiple times at this point in time and every dish I’ve tasted I enjoyed. Couple good food that is wine friendly (grilled meats), good pricing, BYOB option and casual atmosphere and I can’t recommend Istanbul Grill enough. Lupe’s Tex Mex Grill is a small, locally owned set of restaurants situated in the North Texas cities of Bedford, Arlington and Keller. For this review we visited the Arlington location located in the Lincoln Square section of North Arlington just a stones throw from all major entertainment district venues such as the Dallas Cowboys stadium, Rangers Baseball park and Six Flags over Texas amusement park. 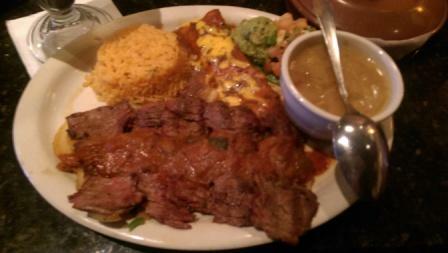 The menu is a healthy selection of classic Tex Mex favorites. The menu is broken up roughly between Appetizers, Grilled Fajitas, Specialties and simpler classic Tex Mex fare such as enchiladas, tacos and the like. There are daily specials as well as lunch specials during the work week. In short, there is a little bit of everything to satisfy just about any Tex Mex craving. I had the Carne a la Tampiquena ($13.99) which is comprised of grilled beef strips and grilled onions topped with a Chipotle sauce. This large, filling entree is served with a cheese enchilada, pinto beans, guacamole and pico de gallo. Your choice of flour or corn tortillas are served on the side so you can create your own soft taco as desired. I found the meat to be tender, almost pull apart and quite flavorful with the Chipotle sauce on top. This dish is recommended. Service was quick and attentive throughout the meal. Kitchen service was properly paced as well. I didn’t notice a wine list (I didn’t ask for one) but the stars here are the cocktails and beers so order a large schooner of your favorite cerveza or margarita and settle in for the ride. It’ll pair much better with the cuisine here anyway. Since they have a mixed beverage license BYOB would not be allowed under state law. Lupe’s accepts all major credit cards. Parking is free self park in the strip center in front of the restaurant. Attire is casual. Shorts or jeans with a decent shirt are perfectly fine. Conclusion: Lupe’s is becoming one of my “go to” Tex Mex restaurants. I’ll be back.